In 1528, Narvaez and his exhibition followed in Ponce de Leon’s footsteps, as well as the famous explorer Hernando DeSoto a few years after Navarez. They were searching for gold, primarily in the form of lost pirate treasure. The prospects of the fountain of youth were wearing thin, the light of the myth growing dim with passing years and no discovery. However, what they found when they arrived was a discovery in and of itself. They met the Apalachee Indians whom they found to be a worthy adversary. In fact, Narvaez writes that they “loomed big and naked, and from a distance liked like giants”. At least they would have a real story to tell their children of giants they encountered during conquest and exploration. The Apalachee were fierce too. In fact, they were so fierce that Spain would make no attempts to reach out to them until the early part of the following century. So they turned their focus back to St. Augustine. At this point, it was pretty obvious that the Florida mainland would be no treasure chest filled with gold and plunder. However, it was important for Spain to control the area to prevent piracy and invasion from other countries. To that end, Menendez arrived with 600 soldiers on August 28, 1565. He had a grand display of trumpets sounding, banners flying, and landed right at the site, and to the surprise, of the Timucan Indian Village of Seloy. After a very rapid period spent fortifying the tiny village of St. Augustine, Spain would use it to try and work as a northern post as well as wipe out another more dangerous scourge… piracy. 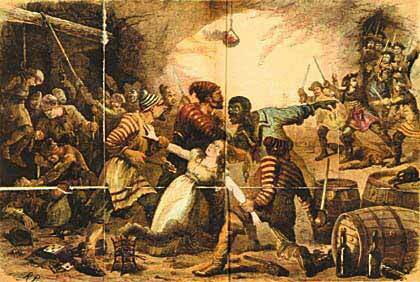 The seas were rampant with cutthroat bandits and runaway slaves, disgruntled merchantmen and youth that were disinherited. They all flocked to the Tortugas, Point Royal, and other known areas that were considered to be centers for piracy recruiting, or “privateering voyages in search of plunder”… that is a fancy way to call piracy by another name. As a result, these pirates would often plunder the places that were most convenient, putting the town of St. Augustine right in the middle of their crosshairs. Menedez did not cherish run ins with these guys one of the most notable pirates came from South Africa. His name was black Caesar and he was ruthless. He was part of the notorious “Blackbeard” pirate crew for a while before he set out on his own. All of that to say Piracy was a real, viable threat to the Spanish settlers of the New World. Throw in a horrible climate and tropical diseases such as malaria, and other types of fever that essentially wiped out a few of Florida’s Indian tribes, and you have one dodgy path to tread in order to secure Florida for Spain.